The tomato is probably the most widely grown vegetable by the home gardener because of its food value, many uses, and relative ease of culture (Figure 1). Originating in Central and South America, the tomato was domesticated in Mexico. There are many related wild species in South America. “Tomati” was the name used by Native Americans. 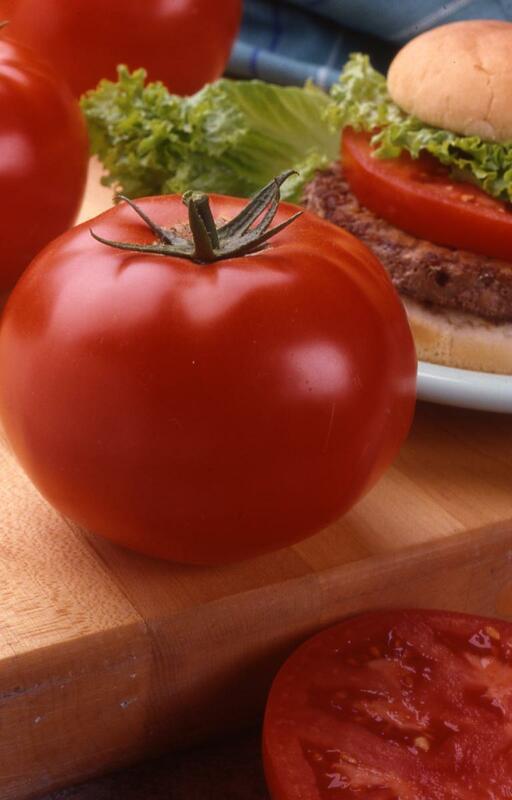 The tomato was first introduced to the United States in the 1700s. It was once thought by early American colonists to be poisonous. Thomas Jefferson was one of the first to grow tomatoes, which were called "Love Apples" at the time. The tomato was not recognized as a useful vegetable until the 1800s. Eaten raw or in innumerable cooked dishes, the tomato is an almost daily part of the American family diet. One medium-sized tomato has only 35 calories. The tomato is rich in vitamins C and A, and contains small amounts of the B vitamins and potassium. Tomatoes are also very well known for their high carotenoid content. Nine different carotenoids have been identified in tomatoes, two of them are beta-carotene and lycopene. Carotenoids are thought to have a number of health benefits, such as reducing the risk of developing cancer, cardiovascular disease, and macular degeneration. There has been a lot of medical and nutritional research on lycopene; incidentally, lycopene is responsible for the red color in tomatoes. About 80 to 90 percent of lycopene consumed by humans comes from tomatoes. Surprisingly enough, lycopene is absorbed better from processed tomato products than from fresh tomatoes. Tomato plants are very productive. When grown as staked plants, tomatoes require a relatively small amount of space, yet are capable of producing 8 to 10 pounds or more of fruit per plant. Some of the more compact tomato cultivars can be easily grown in containers. Hence, gardeners who have limited space can still grow tomatoes. Another option is to participate in a community garden. Gardeners may rent a plot in a community neighborhood garden to grow vegetables. It is an excellent way to garden if space is limited and also a good way to learn as well as share gardening knowledge with others. For a list of community gardens, refer to the website for the American Community Gardening Association at communitygarden.org. Tomatoes are often eaten raw as a garnish for salads and appetizers (Figure 2). They can also be sliced for sandwiches and hamburgers, or added to various pasta, meat, and vegetable dishes. Tomatoes are also used in soups, stews, and sauces. Excess tomatoes can be canned for future use. Growing tomatoes in home gardens is an excellent investment of gardening time and money. It can also be a lot of fun! Figure 1. Tomato is the most popular home grown vegetable in the United States! Tomatoes come in many sizes and colors. Photo by Ken Chamberlain, OSU Section of Communications and Technology. Figure 2. Tomatoes are often eaten raw as a garnish for salads and appetizers. Photo by Jodi Miller, formerly with OSU Section of Communications and Technology. Ohio is well suited for tomato production, and was once ranked second in the nation for processing tomatoes. In addition, tomatoes are widely grown for fresh market by Ohio farmers and gardeners. Tomatoes are warm-season plants and should be planted only after danger of frost has passed unless you are prepared to protect them in the event of a frost. Typically, that date for central Ohio is May 20. The planting time for southern Ohio can be one to two weeks earlier, while the planting time for northern Ohio is one week later. The date does not necessarily mean it is the date when there is no danger of frost at all. There is still a 50 percent or less chance of frost on this date. The odds of a frost event will typically drop an additional 10 percent for each week past this date. Air temperature is an important factor in the production of tomatoes, which are particularly sensitive to low night temperatures and extremely high temperatures. Blossom drop can occur in early spring when daytime temperatures are warm, but night temperatures fall below 55 degrees Fahrenheit. This phenomenon will occur during the summer as well, when daytime temperatures are above 90 degrees Fahrenheit and night temperatures are above 75 degrees Fahrenheit. Tomatoes can be grown on many different soil types, but a deep, loamy, well-drained soil supplied with organic matter and nutrients is most suitable. If you have heavy clay soil in your garden, one option is to add organic matter, such as peat moss or compost, to improve soil structure and drainage. Another option is to grow a cover crop a year before the tomatoes are planted. The cover crop can be plowed under prior to planting. Soil improvement through addition of organic matter or a cover crop can take several years before the soil reaches the “perfect” condition. Less patient gardeners might want to purchase loamy top soil. One of the most productive ways to grow tomatoes is to plant tomato plants in raised beds that are filled with high quality top soil (Figure 3). A good raised bed should be 4 feet wide and 8 to 10 feet long. With a 4 feet wide raised bed, you can easily reach the plants from both sides of the bed. Refer to OSU Extension fact sheet HYG-1641, “Raised Bed Gardening” for more information. This term may not be a household name. Soil reaction is the degree of acidity or alkalinity of a soil. Some gardeners or farmers refer to acidic soil as “sour soil.” Soil reaction is measured in pH scale. A pH of 7 is neutral. A pH value below 7 is acidic while a pH value above 7 is alkaline. As with most garden vegetables, tomatoes grow best in a slightly acid soil with a pH of 6.5 to 6.8. It is a good idea to have your soil tested by a reputable testing lab (Figure 4). Refer to OSU Extension Fact Sheet, HYG-1132, “Soil Testing Is an Excellent Investment for Garden, Lawn, and Landscape Plants, and Commercial Crops,” which is available online at ohioline.osu.edu. The fact sheet includes a list of soil testing labs in Ohio and procedures on taking and preparing soil samples. The soil test reveals the soil pH, buffer pH (also called lime index), and nutrient levels. If the soil pH is not in the right range, lime can be added to raise soil pH while elemental sulfur (also called soil sulfur) can be added to lower soil pH. Soil pH modification can take up to 3 to 6 months. Hence, it is a good idea to have the soil tested a year before tomato plants are planted. However, any time is a good time to have the soil tested as long as soil is not frozen or too wet, if you have never done so. Many home gardeners wait until there is a problem before testing the soil. A soil test prior to planting gives you a baseline for better understanding your soil needs. Proper fertilization will not only ensure optimum production but also avoid unnecessary addition of minerals to the soils. Hence, soil testing can save you money and help protect the environment! Figure 3. Raised beds are a great way to grow tomatoes and other garden vegetables. Photo by Gary Gao, OSU Extension. Figure 4. Soil testing is an excellent way to determine what your soil needs for the best tomato production. Photo by Jodi Miller, formerly with OSU Section of Communications and Technology. Tomato plants require full sun, meaning the more sunlight they receive, they better they will perform. The planting site should receive at least 6 to 8 hours of direct sunlight per day. Tomatoes will not be as productive if they receive less than optimum sunlight exposure. Since tomato plants should be watered on a regular basis, it is a good idea to place the garden close to a water source for ease of watering. Well water in some areas may have high alkalinity and may make soil more alkaline over time. It might be a good idea to have the water tested prior to using it as a regular source of water. Tomatoes are heavy feeders and respond well to fertilizer applications. There is no way to know exactly how much and what type of fertilizers gardeners need to apply without having the soil tested by a soil testing lab. Either too little or too much fertilizer is not good for tomato plants. For example, excess nitrogen fertilizer can result in extremely vigorous vine growth but little to no fruit production. Too little fertilizer, especially nitrogen, results in slow growth and low yields. An application of a starter fertilizer at transplanting will help tomato plants grow faster and flower sooner. Starter solutions are water-soluble fertilizers high in phosphorus. Upon setting plants in the garden, apply a liquid starter solution to each transplant at the rate of one cup per plant so that the root ball is completely saturated. Be sure to follow label directions, because leaf burning and plant death can result from excessive fertilization application. In addition to starter fertilizer, tomatoes need 2 to 3 pounds of a complete fertilizer, such as 6-24-24, 6-12-18, and 8-16-16 per 100 square feet of garden area, or apply fertilizer based on soil test recommendations. Do not use fertilizers containing herbicides in the vegetable garden. Row or band applications make the most efficient use of small amounts of fertilizer. This method allows for fertilizer placement near the plants where it will be of the most use. Make small furrows about 3 inches to each side of the row and 2-3 inches deep. Use caution, however, so that seeds or roots do not come into direct contact with the fertilizer. The entire amount of fertilizer needs to be worked into top 6 inches of the soil prior to planting. An additional sidedressing of a nitrogen fertilizer may be desirable after the first cluster of flowers have set fruit. Sidedressing is the application of fertilizer 2-4 inches beside a row of vegetables. The fertilizer is left on the soil surface rather being dug in. This fertilizer will then need to be watered in. Figure 5. Disease resistance, fruit size and quality, ripening season, and growth habit are some of the common characteristics when selecting tomato cultivars to grow. Shown here is the 1994 All America Selection Winner ‘Big Beef’ cultivar. Photo courtesy of All America Selections (all-americaselections.org). Selecting the right tomato cultivar(s) can be fun as well as challenging. Plant performance in your area, fruit yield and quality, ripening season, growth habit, and disease resistance are some of the common factors to consider when selecting tomato cultivars (Figure 5). There are probably more tomato cultivars available to the home gardener than any other garden vegetable. One publication estimated that the total number of tomato cultivars is more than 7,500. There are about 600 of them available commercially. More and more tomato cultivars are released each year. A few tomato cultivars are listed in this fact sheet, however, it is not realistic to list all of the tomato cultivars available. You can also find many websites that list tomato cultivars. Talk to Extension professionals, Master Gardener volunteers, the employees at local garden centers, other local gardeners, friends, and relatives, to find out what other cultivars do well in your area. Another good source is All-America Selections (AAS). The website is all-americaselections.org. AAS conducts national trials of flower and vegetable cultivars and AAS winners are reliable cultivars. Gardeners can also experiment by trying one or two new cultivars each year. Refer to Tables 1-3 for a list of suggested tomato cultivars. When choosing cultivars, keep in mind the various days to maturity. Days to maturity are the number of days it typically takes a tomato cultivar to ripen from the date of transplanting in the garden, not the date of seeding. Tomatoes are usually categorized as early, mid, or late season in regards to time of ripening. Select several tomato cultivars of different types and ripening time so that you have an abundant supply of tomatoes throughout the season. Another important consideration is whether the tomato cultivar you choose is determinate or indeterminate in growth habit. Determinate (D) tomato plants grow to a certain height and then stop. They also flower and set all their fruits within a relatively short period of time. This is an advantage if the tomatoes are being grown primarily for canning purposes. Determinate plants tend to be smaller plants, and are better suited for caging, staking, or containers. Indeterminate tomato plants grow, flower, and set fruit over the entire growing season. When supported, indeterminate plants continue to grow taller and tend to get “viney” if not pruned; consequently, they will need taller stakes and cages. Some of the indeterminate cultivars can easily grow to 8 feet tall. Without support, the indeterminate plants will grow into a big jungle! There have been tremendous advances in tomato breeding over the years. Tomato breeders have been able to bring many outstanding hybrid tomato cultivars to the market. A great majority of the tomato cultivars available today are hybrids. Hybrid tomatoes are created by having two genetically different parents that are crossed each year to produce the hybrid tomato seed. Hybrids are usually more vigorous or have some superior traits compared to either parent. This is termed hybrid vigor. Gardeners cannot collect and save seeds from the ripe tomatoes since those seeds do not remain genetically true to type. Therefore to get the desired traits, they will need to purchase the seeds from seed producers or dealers. Many hybrids have outstanding taste and disease resistance. What are heirloom tomatoes? There are several definitions. Heirloom tomatoes could be passed down for several generations through a family, or are commercially open-pollinated varieties introduced before 1940. They are also created by crossing two known parents and dehybridizing the resulting seeds for however many years or generations it takes to eliminate the undesirable characteristics. Dehybridizing is where a tomato plant is only allowed to self-pollinate. This process may need to be repeated for up to 8 years. Additionally, they may be selected “mystery” varieties that are a product of natural cross-pollination of other heirloom varieties. Heirloom tomatoes are gaining popularity. There are quite a few good heirloom varieties that are worth noting. Brandywine, Cherokee Purple, Mortgage Lifter, and Rutgers are several popular heirloom varieties. Not all heirloom tomatoes are good. Some of them may be more prone to diseases and cracking. However, gardeners are encouraged to try a few new ones and select the best ones based on their own experience and taste preference. Another characteristic to look for when choosing tomato cultivars is disease resistance. Many cultivar names are followed by one or more letters indicating resistance to Verticillium wilt (V), Fusarium wilt (F), nematodes (N), Tobacco Mosaic Virus (T), Alternaria stem canker (ASC), and Septoria leaf spot (L). Disease resistance can be an important consideration since most home gardeners are not equipped or willing to spray pesticides on a regular basis to manage diseases. In addition, diseases are challenging to control with fungicides due to the timing of the spray applications. Furthermore, some of these diseases can only be effectively managed through host plant resistance. Early Girl 50 I V,F 4-5 oz. One of the earliest tomato cultivars with bright red round fruit and good flavor. Bush Steak 65 D 8-12 oz. Compact plant (20-24 inches) loaded with large flavorful tomatoes. Big meaty fruit and early maturity on a dwarf plant, perfect for a small garden and patio containers. Better Boy 70 I V,F,N, ASC 10 oz. A trusted favorite for many years, a great performer with big hybrid-quality yields of succulent, juicy yet meaty tomatoes. Celebrity 70 D V,F,N, ASC 7 oz. All-purpose variety with superb flavor. Plants are very productive. Fruits are crack-resistant. Mountain Delight 70 D V,F 10 oz. Plant produces good yields of large red tomatoes. Tomatoes are firm and flavorful. Pik Red 71 D V,F,N 6-7 oz. Fruit is smooth and meaty. The sturdy vines are dwarf in size, but put out an incredible production of good-sized fruit. Is also suitable for growing in containers. Jet Star 72 I V,F 6-8 oz. Fruit is tasty and mild-flavored, matures early with tremendous yields. Large, attractive globes have few scars or cracks. Big Beef 73 I V,F,N,T, ASC 10 oz. Has the traditional tomato flavor with the improvement of hybrid yields. Fruits are big and good for slicing or for salads. It can be used for slicing, sauce, canning, and salad. Mountain Pride 74 D V,F, ASC 10 oz. Plants are vigorous and produce very large firm fruits. Supersonic 79 I V,F 10 oz. Heavy production of large meaty tomatoes with good flavor. Beefmaster 80 I V,F,N, ASC 16 oz. Produces high yields of large meaty beefsteak tomatoes. Fruits are deep red and are excellent for salads or sandwiches. Supersteak 80 I V,F,N 2 lbs. Productive plants produce huge red beefsteak type tomatoes with meaty flavor. Excellent for salads and sandwiches. Mountain Gold 70 D V,F 8 oz. Round golden-yellow fruits with a sweet, mild flavor. Lemon Boy 72 I V,F,N, ASC 7 oz. Bright lemon-yellow tomatoes with mild sweet flavor. Jubilee 80 I 8 oz. Golden-yellow fruits with low acidity and excellent taste. Golden Boy 80 I 8 oz. Low-acid, mild flavored fruit, golden colored and globe shaped. Very meaty with excellent yields. Sungold Cherry 56 I V, F,T Golden-orange fruits with a very sweet flavor. Juliet Grape 60 I The 1 ounce pink glossy tomatoes are produced in clusters like grapes on long vigorous indeterminate vines. Sugary Cherry 60 I Half-ounce dark pink fruits are very sweet, borne in clusters like grapes, and oval with a pointed blossom end. Small Fry Cherry 65 D V,F,N,ASC Bright red, 1 inch cherry tomatoes borne in clusters of 7 to 8. Good for growing in containers and small gardens. Sweet 100 Cherry 65 I Huge, multiple-branched clusters of ½ inch very sweet fruits. Vigorous and very productive vines. Super Sweet 100 Cherry 65 I F,T,V Huge, multiple-branched clusters of ½ inch very sweet fruit. Vigorous vines bear abundantly until frost. Sweet Million Cherry 65 I F,T An improved version of Sweet 100, offers the same wonderful flavor and yields, with much better disease resistance and tolerance to cracking. Sunsugar Cherry 65 I F,T A medium-sized, orange cherry type with intense sweet flavor. Very vigorous and productive. Jolly Grape 70 I Abundant clusters of 1½ ounce peach-shaped pink fruits. Expect 9 to 14 tomatoes per cluster. Yellow Pear Pear 75 I V,F A very tasty pear-shaped yellow tomato. Very productive. Due to their long growing season and temperature requirements, tomatoes should be set out as transplants in Ohio gardens. In central Ohio, the last spring frost date is around May 20, and tomatoes may be planted anytime after this. Gardeners can “beat the season” and plant tomatoes a week or so earlier but, special efforts must be made to protect plants from potential frosts. When purchasing tomato transplants, choose those with straight, sturdy stems about the thickness of a pencil. They should have four to six young true leaves, no blossoms or fruit, and be free of insect pests and diseases. Healthy transplants will experience little or no transplanting shock and should become established quickly in the garden. Tomato plants will develop roots along the stem and may be set deeply at transplanting with the first set of leaves near the soil surface. If transplants are in peat pots, remove the rim of the pot or be sure the rim is below the soil surface, so that the soil ball will not dry out. If only “leggy” transplants are available, set the transplants at a 30-degree angle in a planting trench leaving 5 or 6 inches of the upper plant tips exposed. The depth of the trench should be about 5 inches. Roots will develop along the buried portion of the stem. Tomatoes are the only types of plants where this trenching method of planting can work. A soluble starter fertilizer high in phosphorus can be applied at planting time to promote root development. Use according to label directions. Refer to the sections on soil reaction and fertilization for more information. Proper spacing and plant support are essential for plant health and good fruit production. Gardeners tend to plant tomato plants too close to one another since transplants are small at planting time. Keep in mind that some of the indeterminate tomato plants can easily grow at least 6 feet tall in one season. Determine what type of support system you will use as this helps to guide plant spacing. Since caging and staking are two common ways to support tomato plants, planting distances are determined by these techniques. When using stakes for tomato plants, set plants 2 feet apart in the row and 3 to 4 feet between rows. When using tomato cages, plant tomatoes 2.5 to 3 feet in the row and 4 to 5 feet between rows. Stakes and cages should be placed at planting time or soon thereafter so as not to disturb the roots. Supported tomato plants either through staking or caging tend to be more productive and produce higher quality fruits than unsupported plants. Fruits on supported tomato plants are also easier to harvest. Fewer fruits are lost to fruit rot due to lying on the ground. Improved air circulation in supported tomato plants will reduce disease pressure. There are advantages and disadvantages with either method. Gardeners can choose either method or both depending on their needs and availability of materials and their costs. Staking is one good way to support tomato plants. It is used when gardeners desire bigger fruits and early ripening (Figure 6a and 6b). However, possible drawbacks might include reduced yields due to fewer number of stems and an increase in sunscald of fruit since fruits are more exposed to sunlight. Figure 6a. Staking is a good way to support tomato plants if gardeners desire fewer, but bigger tomatoes. Shown here are staked young tomato plants using bamboo poles. Photo by Gary Gao, OSU Extension. Figure 6b. Staked tomato plants in summer in a vegetable garden. Photo courtesy of National Gardening Bureau (ngb.org/index.cfm). There are several variations of staking tomato plants. Two-inch oak stakes can be used for each plant with tomatoes “tied” to the stake. A section of cattle panel fencing can be used as physical support. The stakes should be at least 8-feet tall. The stakes should be driven about 1 foot into the ground and sometimes deeper depending on fruit loads and potential wind speed so that plants will not tip over when loaded with fruit. The stakes should be set in place at the time of planting and should be placed about 4 inches from the plant. The tomato plant should be tied to stake by fastening a soft cloth in a “Figure 8,” one loop around the stake and the other around the main stem of tomato plant. Select one main stem per plant when staking; as the plant grows, remove suckers (or laterals) completely or pinch suckers beyond the first two leaflets. Florida basket weave system is a variation of the staking method. It is also called the stake-and-weave system. Stakes are placed between every two or three plants. Strong T-posts are driven into the soil at each end of the row. When the plants reach 12-inches tall, untreated twine is tied to the T-post at one end of the row, then looped around each stake down the row. The twine is looped around the T-post at the other end of the row. The twine is then passed down the other side to catch the plant between the two strings. Additional strings should be added as the plants grow taller, about 1 foot apart. Tomato suckers are also called laterals or side shoots. Suckers are the new growth that appears in the leaf axile between the stem and a leaf. If left to grow, a sucker can become another strong stem with flowers and fruit. Tomato suckers can directly compete with the main stem for nutrients, water, and sunlight, thus weakening the main stem. Refer to Figure 7 for an illustration of a sucker. Pruning is the removal of plant parts, and is quite important in staked tomatoes. In tomatoes, pruning mainly involves the removal of suckers or laterals. With the staking method, one main stem is selected and kept while all of the suckers or lateral branches are removed. There are two common ways to remove suckers (Figure 7). One is called simple pruning, which is accomplished by gently breaking off the entire young sucker at the base near the leaf axile. A second method of sucker removal is called Missouri pruning, which is done by pinching off the growing tip of the sucker just beyond the first two leaflets of a sucker. The advantage of this method is that there is more foliage left for photosynthesis (food production) and better leaf cover to help protect the developing fruits from sun-scald. It will be necessary to check your plants weekly for sucker development. Pruning is more critical in indeterminate tomatoes than determinate ones. With determinate tomato cultivars, gardeners only need to keep tomato plants free of suckers below the first fruit cluster. With indeterminate tomato cultivars, gardeners need to remove all of the suckers either completely or the growing tips of suckers just beyond the two leaves of each sucker. About one month before the first frost in autumn, gardeners can also top the indeterminate tomatoes by removing the top 4 inches of the main stem. Topping helps slow down the growth, thus channeling more of the sugar into ripening fruits. Caging is also a popular way to support tomato plants (Figure 8). Caging is when tomato plants are supported on all sides by enclosing them in a wire cage. Many tomato cages of various sizes are sold at garden centers and hardware stores. Handy gardeners can also construct their own tomato cages with wire mesh such as concrete reinforcement wire. When making your own cages, it is important to remember that the cage should have a big enough opening to allow your hand to reach in and harvest the fruit. The openings should be at least 6 by 6 inches. Cages should be set into the ground at the time of planting. They should be driven about 8-12 inches into the ground to prevent them from falling over. Caged tomatoes are more productive since suckers do not need to be removed. There is less sun-scald of fruits since there is greater foliage cover. One major disadvantage of caging tomatoes is that fruits will ripen later. This is due to a heavier fruit load on caged tomato plants. Since no suckers need to be removed, caged tomato plants require less maintenance. Figure 7. Simple pruning in tomato is the removal of suckers at the base. Missouri pruning is the removal of growing tips just beyond the two leaflets. Photos by Gary Gao, OSU Extension. Figure 8. Caging is also a very popular way to support tomato plants. Caged tomato plants tend to be more productive, but fruits might ripen later due to heavier fruit load. Photo by Gary Gao, OSU Extension. Where space is limited or soil conditions are poor, tomato plants can be grown in containers using a planting mix (Figure 9). Any container is suitable as long as drainage is provided. Professional potting mixes for container gardening are widely available. Some manufacturers also add slow-release fertilizer and/or a polymer for additional water retention. Gardeners should also select the tomato cultivars that are compact and adapted for container production. Pay close attention to water and fertilizer needs of container-grown tomato plants since they can dry out very quickly and nutrients leach out of potting mixes. Figure 9. Some tomato cultivars are very compact and can be grown in containers. Photo by Gary Gao, OSU Extension. Tomato plants need about 1 to 1½ inches of water per week. Water plants in the morning for the best success. Watering plants in the evening keeps roots and leaves wet longer, thus encouraging the development of diseases. There is no need to water the leaves; only plant roots need to be watered. Soaker hoses or drip irrigation are great ways to deliver water directly to plant roots. Watering cans or hoses also work too. If possible, avoid using an overhead sprinkler since leaves will remain wet for longer periods of time, increasing the potential for disease. An even moisture supply is important, especially once tomato fruits begin to develop. If the soil becomes too dry, blossom-end rot can be a problem. Sometimes, it might be necessary to water larger, mature tomato plants two to three times a week during the summer months. Tomato fruit skins might crack or split when tomato plants receive too much water after a prolonged dry period. Additionally, fruit cracking sometimes occurs during ripening. This is due to the presence of the high sugar content in fruit and the absorption of water through the fruit surface due to rain or overhead watering. Once the tomato plants are established, apply a mulch to conserve moisture and suppress weed growth. Apply 2-3 inches of organic mulch such as weed free straw or bark chips after the soil has had a chance to warm up; this is typically around early June. Mulching too early will keep the soil cool and slow root growth, and consequently plant growth, which ultimately will reduce plant yield. Black plastic mulch also be used as a mulch. It is more commonly used by commercial growers, but can be used successfully in the home gardens. Black plastic mulch helps to prevent weeds in the plant row, warms up the soil in the spring, reduces soil splashing onto fruit and foliage, helps soil retain moisture, and will help shed moisture under heavy rainfall events. Black plastic mulch works well when used in combination with a raised bed. Black plastic mulch is rolled out after soil preparation, secured or tucked with soil to hold firm against soil and then holes are punched through the plastic and plants are set into these holes. Some of the tomato diseases in Ohio are anthracnose, early blight, Fusarium wilt, late blight, Septoria leaf spot, Verticillium Wilt, and nematodes. Home gardeners are encouraged to select disease resistant tomatoes cultivars. Cultural practices and fungicide sprays can be a part of effective disease management program. Refer to OSU Extension fact sheets for more information on disease diagnosis and management. Some of the insects that can cause damage to tomatoes in Ohio are aphids, cabbage looper, Colorado potato beetle, flea beetles, hornworms, stinkbugs, tomato fruitworm, and the variegated cutworm. Refer to OSU Extension fact sheets for more information on insect diagnosis and pesticide recommendations. Weeds too are likely to grow and can be pulled by hand or removed by shallow cultivation. Herbicides are sometimes used in large tomato plantings, but are not practical in small gardens. Tomato fruit development goes through several stages. First, the fruit grows in size until it reaches the full size, which is called the mature green stage. It takes about 40 to 50 days for the tomato fruit to go from fruit set to the mature green stage. Once the fruit reaches the mature green stage, a change in fruit color will start taking place so that fruit can take on its characteristic red, pink, yellow, or orange color from its light green color at the mature green stage. Tomato fruit ripening is controlled by temperatures, genetic makeup, and presence of ethylene gas. The optimum temperature range for ripening mature green tomatoes is 68 to 77 degrees Fahrenheit. The red color typical of most tomato cultivars does not form when temperatures are above 86 degrees Fahrenheit, but yellow pigment continues to develop. Thus, tomatoes that ripen during extreme hot weather are often yellowish-orange. For optimum flavor, tomato fruits should be allowed to ripen fully on the vine, but should be picked before they begin to soften. Tomatoes that have reached mature green stage can be harvested and allowed to ripen at 60 to 65 degrees Fahrenheit indoors. In autumn, green tomatoes can be harvested before early frosts damage fruits. Ripe tomatoes can be stored for one to two weeks if held at 50 to 55 degrees Fahrenheit. The kitchen counter is typically a good place to store ripe tomatoes. It is not a good idea to store tomatoes in a refrigerator since cold temperatures will cause tomatoes to lose their flavor and turn mushy. Figure 10. Blossom-end rot is a common problem of early tomatoes. It is not caused by infectious disease, but a calcium deficiency. Photo by Gary Gao, OSU Extension. Blossom-end rot is characterized as a dry, sunken, black spot or area on the blossom end of the fruit (Figure 10). This problem is not caused by an infectious disease, but rather an insufficient supply of calcium in the fruit due to cold soil, pH imbalance, water stress, excessive nitrogen, and possibly limited availability of calcium in soil. Blossom-end rot is more common on early tomatoes. Mulching, more frequent watering, correction of soil pH imbalance, liming, pruning, and calcium sprays might help. Refer to OSU Extension fact sheet HYG-3117, “Blossom-End Rot of Tomato, Pepper, and Eggplant” for more information. Blossom drop is caused by temperature extremes. When nighttime air temperatures are either below 55 degrees Fahrenheit or higher than 75 degrees Fahrenheit, fruits are not set, and unpollinated blossoms fall off. Catfacing is puckering and scarring at the blossom end of the fruit. Cavities may penetrate deep into the fruit. Cool and cloudy weather at bloom may cause the blossom to stick to the young, developing fruit, resulting in the malformation. Damage from a broadleaf weedkiller such as 2, 4-D will also cause fruit distortion. Poor fruit set can be caused by extreme temperatures, drought, shading, and excessive nitrogen applications. Blossom drop occurs when there are temperature extremes. When air temperatures are either below 55 degrees Fahrenheit or higher than 75 degrees Fahrenheit, blossoms fall off and fruits are not set. Extreme temperatures can't be controlled of course, so gardeners have to “wait it out.” However, over application of nitrogen (fertilizers) can be controlled as long as gardeners follow soil test recommendations or guidelines. Tomatoes are highly susceptible to black walnut toxicity. The roots of black walnut (Juglans nigra L.) and Butternut (Juglans cinerea L.) produce a substance known as juglone (5-hydroxy-alphanapthaquinone). In addition, Persian (English or Carpathian) walnut trees are sometimes grafted onto black walnut rootstocks which cause the same problem. Many plants such as tomato, potato, blackberry, blueberry, azalea, mountain laurel, rhododendron, red pine, and apple may be stunted or killed within one to two months when planted within the root zone of these trees. The toxic zone from a mature tree occurs on average in a 50 to 60 foot radius from the trunk, but can be up to 80 feet. The area affected extends outward each year as a tree enlarges. Young trees 2- to 8-feet high can have a root diameter twice the height of the tree, with susceptible plants dead within the root zone area and plant dying at the margins of the root zone. Be aware of this potential problem when selecting the site for your tomatoes. Nothing beats garden fresh tomatoes right off the vine. Tomatoes are relatively easy to grow in home gardens and many fruits can be produced in a relatively small area. Some tomato cultivars can be grown in containers, thus making successful tomato growing attainable for most people. If production is abundant and there are excess tomatoes, they can be preserved through canning or freezing. Some gardeners make salsa with their home grown vegetables. Home gardeners are encouraged to call their local Extension offices if they have questions about gardening or food preservation. OSU Extension also has many fact sheets on gardening or food preservation. Log on to OSU Extension's Ohioline at ohioline.osu.edu for more information. Lerner, B.R. Purdue University Cooperative Extension Fact Sheet, HO-26-W, "Tomatoes." Whealy, K. Compiler. Seed Savers Exchange. 2005. Garden Seed Inventory, Sixth Edition, An Inventory of Seed Catalogs Listing All Non-hybrid Vegetable Seeds Available in the United States and Canada. The authors gratefully acknowledge the work of James D. Utzinger and Marianne Riofrio, on whose fact sheet this is based. We would also like to thank Rosie Lerner, Extension Consumer Horticulture Specialist and Master Gardener State Coordinator of Purdue University, for her permission to use some of the information in her fact sheet on tomatoes. Our sincere appreciation also goes to Ken Chamberlain of OSU Section of Communications and Technology, and Jodi Miller formerly of OSU Section of Communications and Technology for the use of their photos. The authors would like to thank Pam Bennett, Extension Educator and Assistant Professor with OSU Extension in Clark County; Erik Draper, Extension Educator and Assistant Professor with Ohio State University Extension in Geauga County; and Rosie Lerner, Consumer Horticulture Specialist and Master Gardener State Coordinator of Purdue University for reviewing this fact sheet.